Our societies have to pronounce on the unjustifiable character of meat consumption from an ethical viewpoint: it involves sacrificing the basic interests of�innumerable sentient beings whereas eating meat is unnecessary. Let's abolish meat! It is a sad assessment that, despite the fact that the animals used for food represent almost all the animals exploited, they are extremely invisibilized.� It is up to us, activists, to make their lives and their miserable destiny visible and to present prospects for putting�an end to their slaughtering.� It is up to us to proclaim that it is morally necessary to abolish the exploitation of animals used for their flesh. As you know, the World Week for the Abolition of Meat (http://www.meat-abolition.org/en/wwam) organized at the end of January which was�very successful (http://www.meat-abolition.org/en/event/2011-01/closing_communique) was organized in both Americas, in Asia and in Europe. 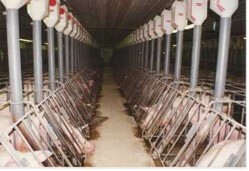 The next WWAM (http://www.meat-abolition.org/en/call) will take place between May 21 and May 28, 2011. The aim is to promote again and again the idea that the production and consumption of animal flesh must be abolished (http://www.meat-abolition.org/en/presentation). We will take action as long as the demand remains necessary. Our societies have to pronounce on the unjustifiable character of meat consumption from an ethical viewpoint: it involves sacrificing the basic interests of�innumerable sentient beings whereas eating meat is unnecessary. The idea is to claim loud and clear that it is not only the duty of each individual to stop supporting the murderous exploitation required by the consumption of animal flesh and "by-products", but that it is also, therefore, the duty of societies as a whole to declare themselves in favor of the banning of farming, fishing and hunting. 1) plan actions for this upcoming WWAM and publish announcements of your actions on this form (http://meat-abolition.org/publish) -- this is essential for promotion! You can find material here: http://www.meat-abolition.org/en/resources. 6) make contributions on the subject (such as analysis texts, fiction, poetry, drawings, films, performances, banners, etc.) that may� get published on the website. To subscribe, send a blank message to: abolitiongroup-subscribe(at)yahoogroups.com.